I work in the same building as Border Grill, but I can count the number of times I’ve stepped in on one hand. It just hasn’t been too much of a draw for me and my co-workers; it’s a bit pricey for a casual bite and just not quite as appealing as, say…Drago or Chaya for a more upscale meal. 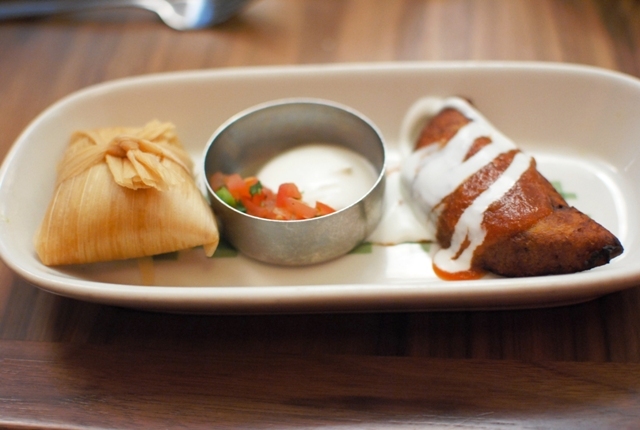 Formerly Ciudad, it was re-branded a Border Grill in October – honestly, I’ve found it to be pretty much the same restaurant. 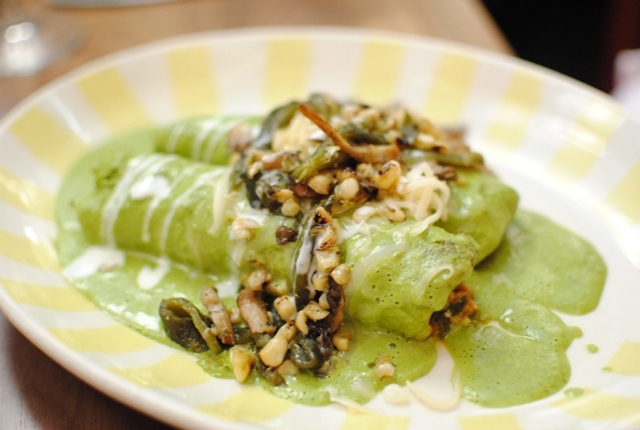 When dineLA came around, the restaurant offered a $16 3-course lunch with a variety of choices. I figured it was as good a time as any to give it a try. 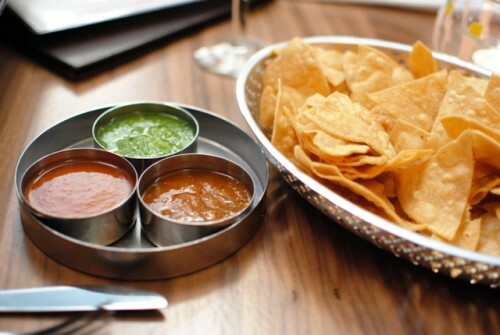 Every table starts with some warm tortilla chips and a trio of salsas. 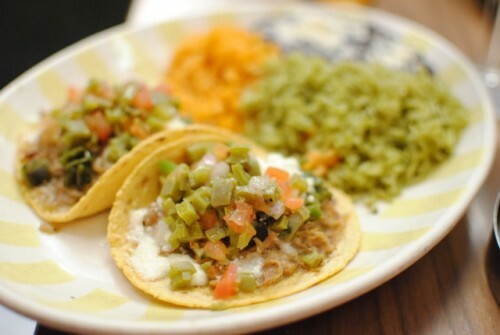 This is a really nice way to start with fresh tortilla chips, and my favorite salsa is the green tomatillo. My co-workers ordered the empanada/tamale and soup, while I opted for the ceviche. 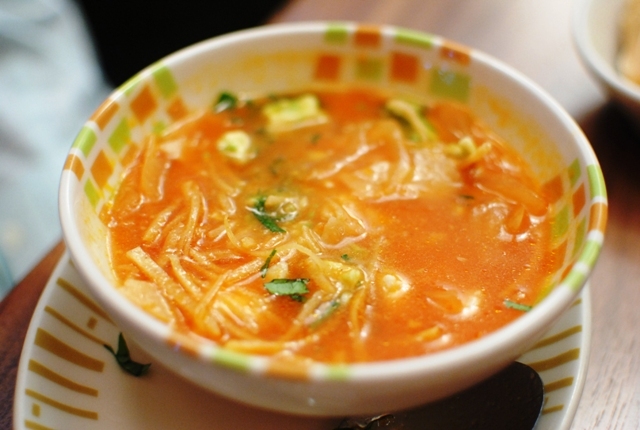 I snuck a taste of the tortilla soup. I didn’t think it had too much flavor, though it was welcome on a cold day. 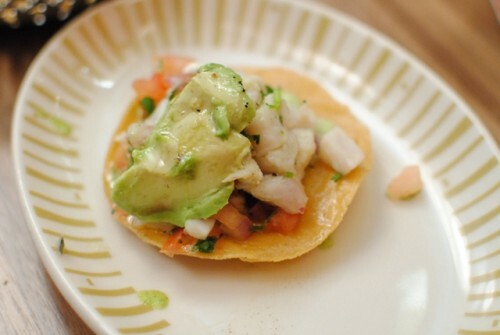 The ceviche, on the other hand, had bright fresh flavors with the lime, cilantro and avocado complementing the fish. A little bit of jalapeno provided the heat, while the fried corn tortilla added some texture. 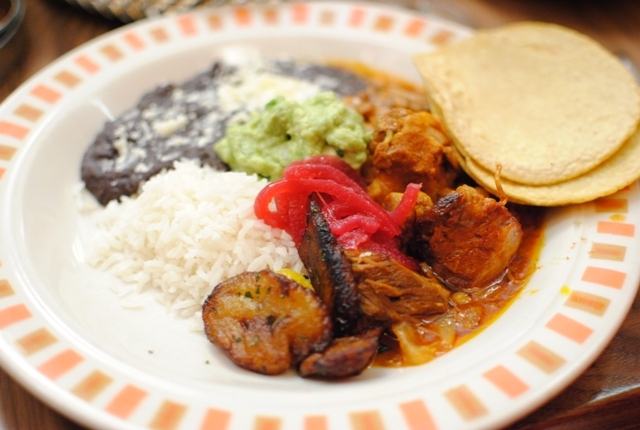 My co-workers went for the pork taco and enchilada, while I had the Yucatan pork. The pork was pretty tender, though not as flavorful as I expected from a piece of pork shoulder. I liked the variety of sides, though, and the guacamole was excellent. 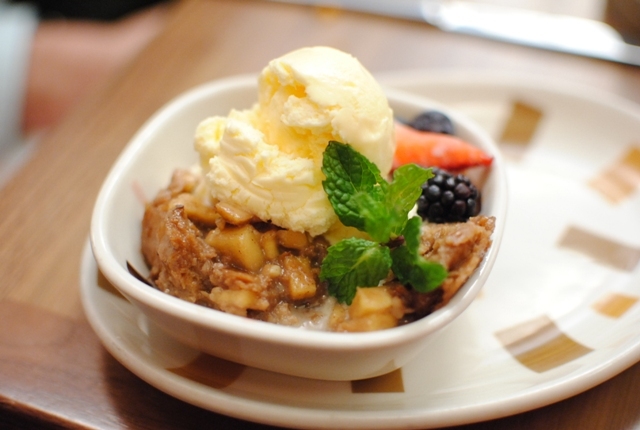 This bread pudding was lukewarm. A little bit of cinnamon spice was apparent, and it had a good apple flavor. Not bad, but nothing special. 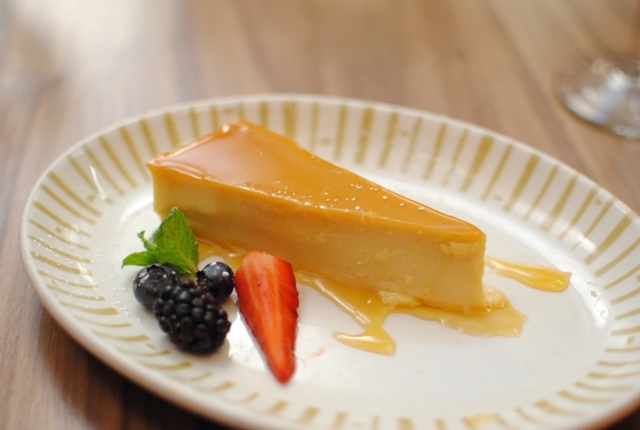 The flan was much richer than I anticipated, with a strong but not overwhelming goat cheese flavor. I liked the caramel, which added a welcome sweetness. Our meal at Border Grill was okay. Nothing really stood out strongly in the positive or negative, but I think the meal was a pretty good deal at $16. However, with so many stronger dining options in downtown, I’m not sure when I’ll be back. Maybe for happy hour. Hah! Yeah, I’ve heard other similar reviews as well. A gift certificate always helps! 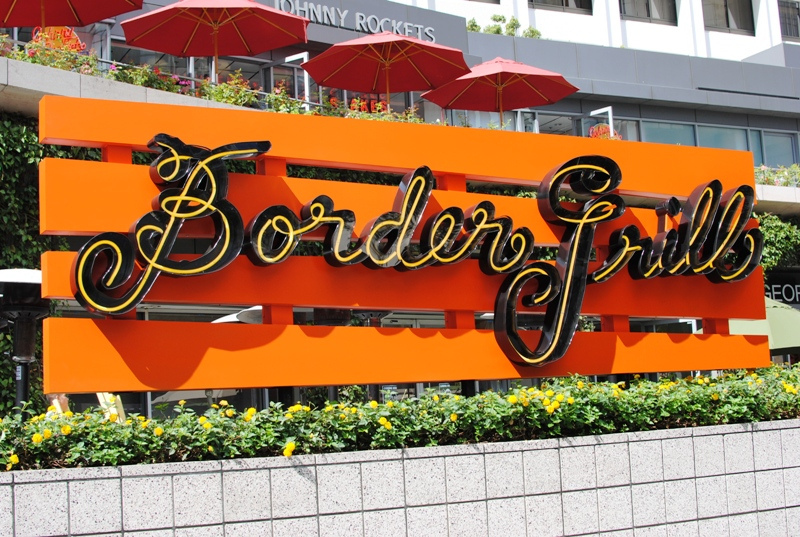 I think Border Grill may have been a more unique concept in the 90’s with its upscale Mexican cuisine, but not as much nowadays.